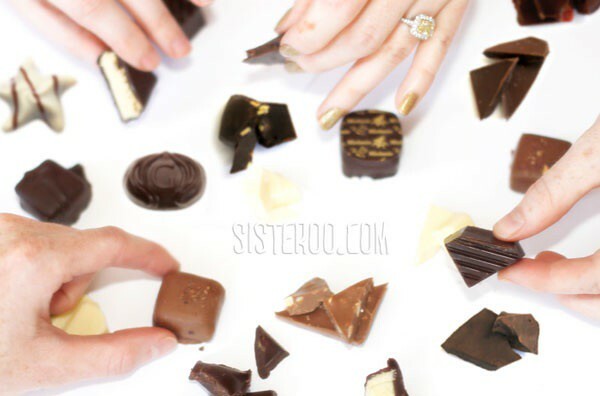 Purchasing the right chocolate is the first step to hosting a FABULOUS chocolate party. I visited Lady Chocolatt in West Los Angeles and picked up a box of four of their most popular chocolate pieces--milk chocolate pomegranate, Ecuadorean raspberry, dark chocolate coconut, and darker chocolate with anise seed. Oh what a chocoholic's dream! These were rich, exotic, and flavorful pieces. The sour pomegranate flavors mixed beautifully with the warm, velvety milk chocolate. The Ecuador chocolate--a little bit stronger than its Swiss counterpart--tasted practically melodious with subtle raspberry undertones. The dark chocolate coconut was my favorite--the fatty, mellow coconut blended perfectly with the bitter dark chocolate. And the darkest chocolate with anise seed (Artist's favorite of the four) was complex, but surprisingly subtle--the sharp taste of anise canceled out any bitterness from the dark chocolate, leaving a delicate licorice aftertaste. The one downside to these incredible chocolates was the price. If you are planning your own party, I recommend checking out your local organic or upper-scale grocer for chocolate first. They often sell a variety of quality chocolate brands like Lindt, Green & Black's, Marks & Spencer's Gourmet, Cadbury, Scharffen Berger, Weiss, Chocovic, Godiva, Leonidas, Ghirardelli, and Sees. In the U.S., good stores you might want to try are Trader Joe's, Gelsons, and Whole Foods. If you're living or traveling abroad, I highly recommend Marks & Spencers, Waitrose, Tesco and Sainsburys. When deciding what chocolate to purchase, check the back of the chocolate bar to find the percentage of cocoa it contains (it usually ranges from 25-85%)--if the bar doesn't list it, it's probably a cheap chocolate, and you don't want to purchase it. You will want to include a full range of chocolates for your party, so make sure you have selections from the white end of the spectrum (0% cocoa) all the way to the bitter dark end of the spectrum (80-90% cocoa). This will give your party guests the full chocolate experience. Join us tomorrow for Artist's post on Chocolate Tasting Party Set-Up--tasting plates, pallet cleansers, scorecards...the whole nine yards!